Grant Management USA delivers training programs across America that dramatically enhance grant management performance and administrative excellence. We are experts in stimulus funding compliance. We have coached, trained, and consulted for nearly 10,000 top-rank organizations and more than 20,000 individual achievers from every imaginable domain: leaders of government, philanthropists, academics, outstanding nonprofit managers, top performing staffers, everyday heroes. And because we learn as we teach, we have synthesized these champions' highest knowledge into one high-impact, fluff-free, fast-paced and thoroughly enjoyable learning experience. Our woven message of excellence is our trademark and is why Grant Management USA is the fastest growing, most highly sought after grant management and grant writing training in America. 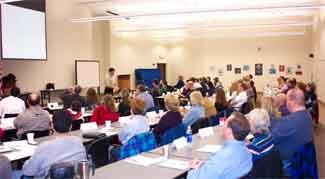 View our nationwide event schedule or get free training by hosting a workshop.